You all loved the teacup and saucer that I found on Etsy yesterday so much, I thought I’d share another one with you: a teacup pincushion! It even has a little teabag peeking out. So cute! It’s a bit more practical than yesterday’s teacup, but just as pretty. 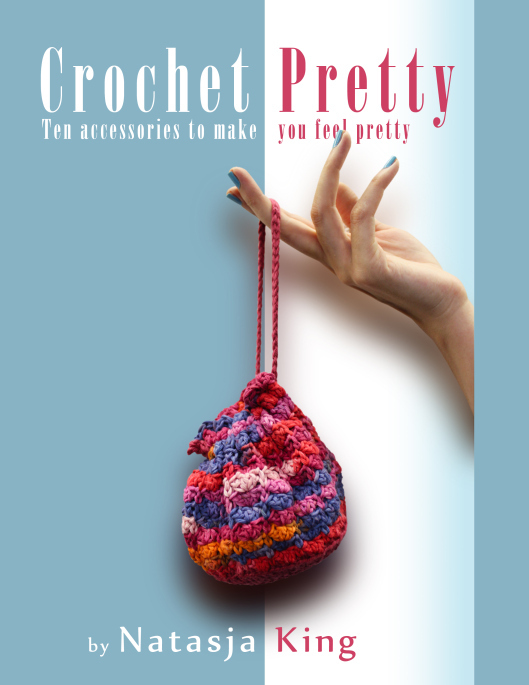 Imagine crocheting it in a pastel colour and adding some flowery embroidery?! You can find the pattern here (you have to log into the Lionbrand website to access the pattern). 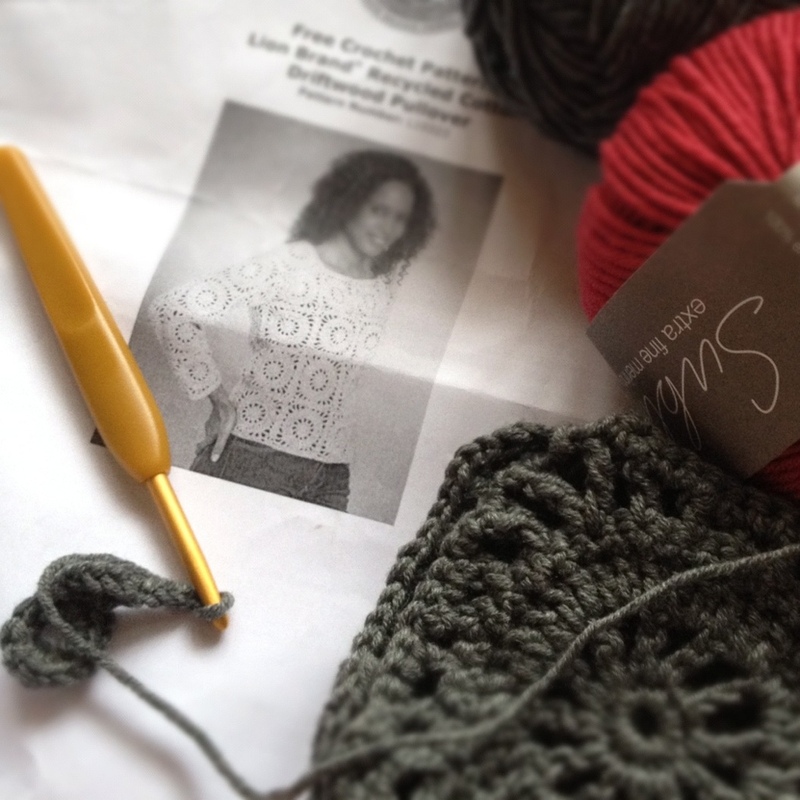 In my Christmas Eve blogpost I briefly mentioned the draft stopper that I am making. (You may have skimmed over that sentence because it was a post about completion of my Winter (AndI’mStillTotallyInLoveWithIt) cowl.) Anyhoo, this post is all about the draft stopper. Before I unveil the Striped Stopper, I have to give some background info. Our livingroom door is one foot away from our front door so any cold air seeping through the letterbox promptly whooshes into the living room via that teeny tiny opening underneath the door. We’ve been using an old towel to try to keep out the arctic air, but that just looks tacky. ….. are you sure about that? So what did I do? 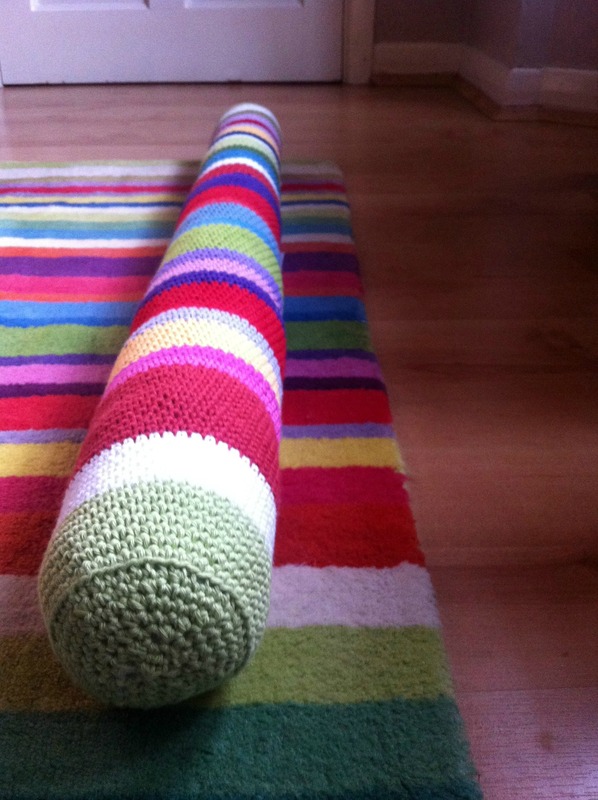 I made a 18 colour striped draft stopper that matches our striped Ikea carpet exactly! If you lay it flat on the carpet, you can’t even see the stopper, that’s how not stand out-ishly good it is. It looks sooooooo nice against the door. 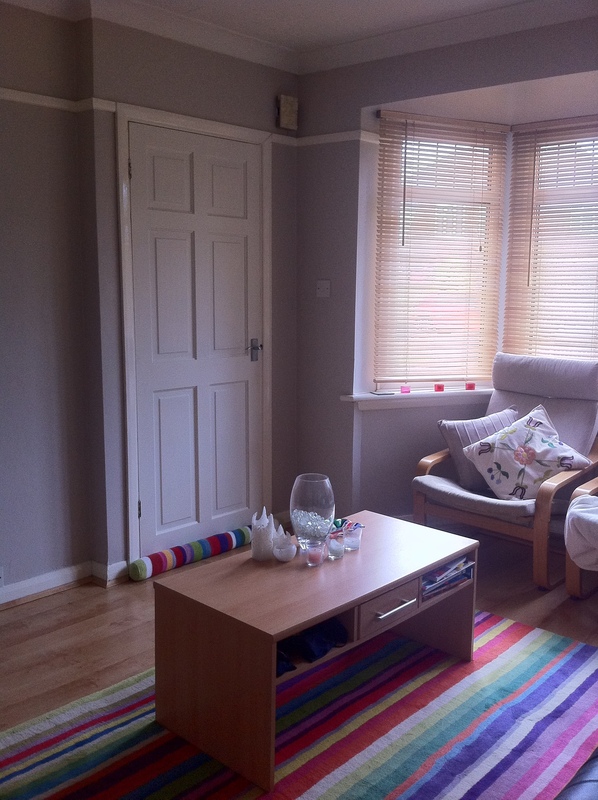 Even though it’s very bright and striped, it blends in fantastically with the rest of the room. 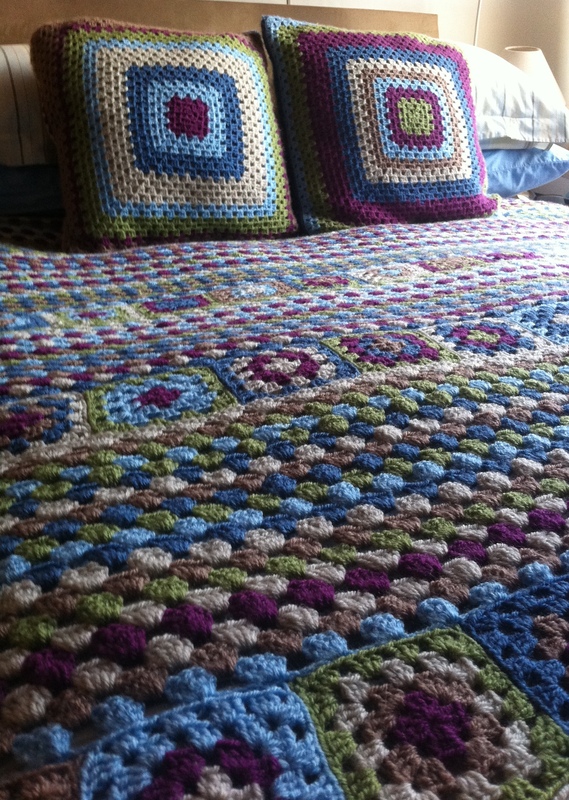 I used Rowan Handknit Cotton and Drops Paris from my stash and a 4mm hook. You can see the stash, and the carpet, here. I followed the Lionbrand pattern, but added an extra round so that my tube ended up being just a tad wider than theirs. In other words, instead of 36 stitches for a round, I have 42. 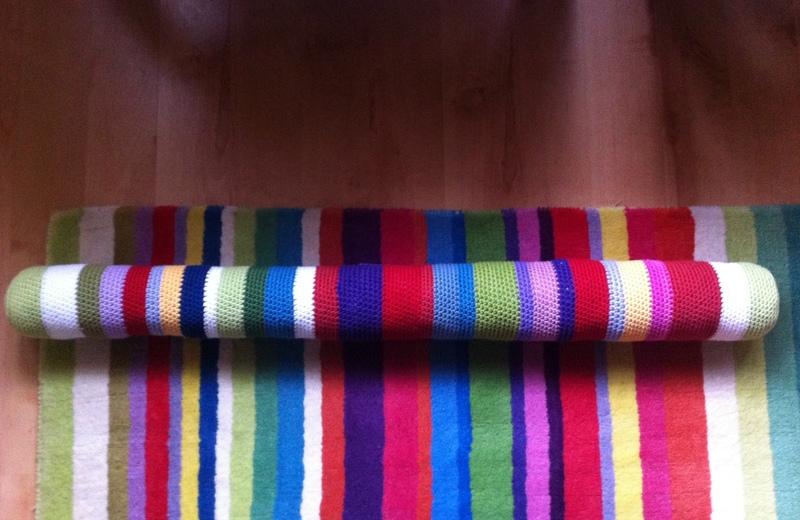 I obviously also didn’t follow their stripe sequence as I had to keep the width of my stripes the same as my carpet. 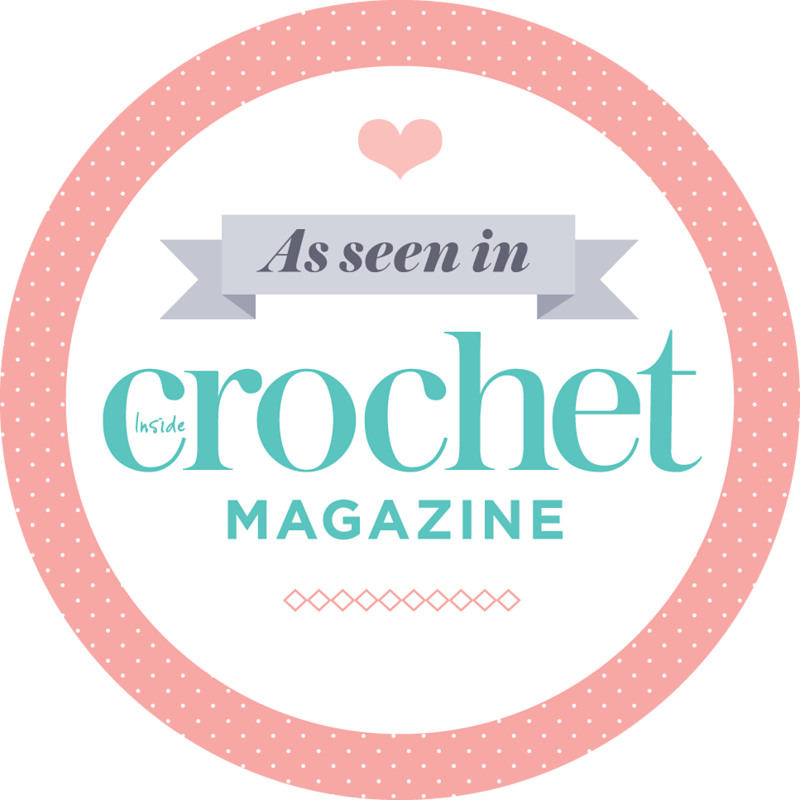 I actually finished the crocheting on Boxing Day, but had to wait for the postman to deliver little plastic pellets so that I could stuff it and crochet the end. 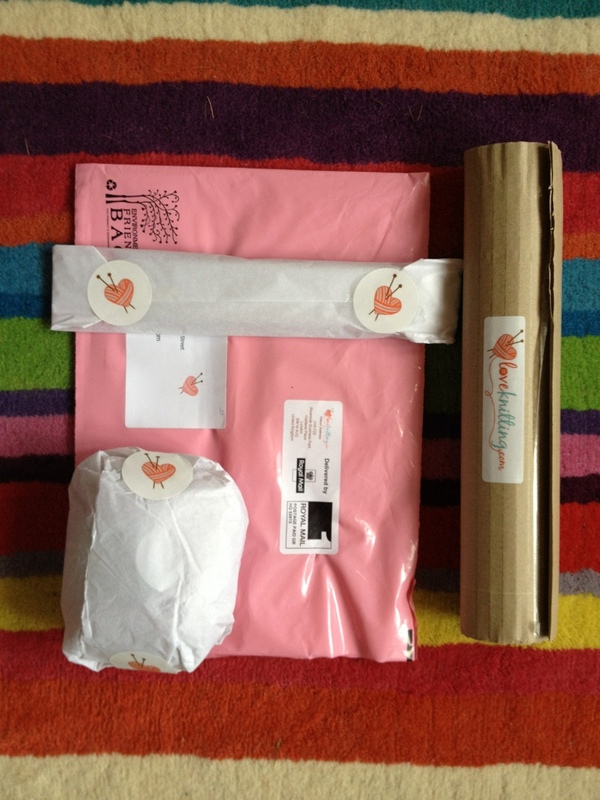 It’s stuffed with alternating layers of plastic pellets (for weight) and polyester stuffing (as insulation). 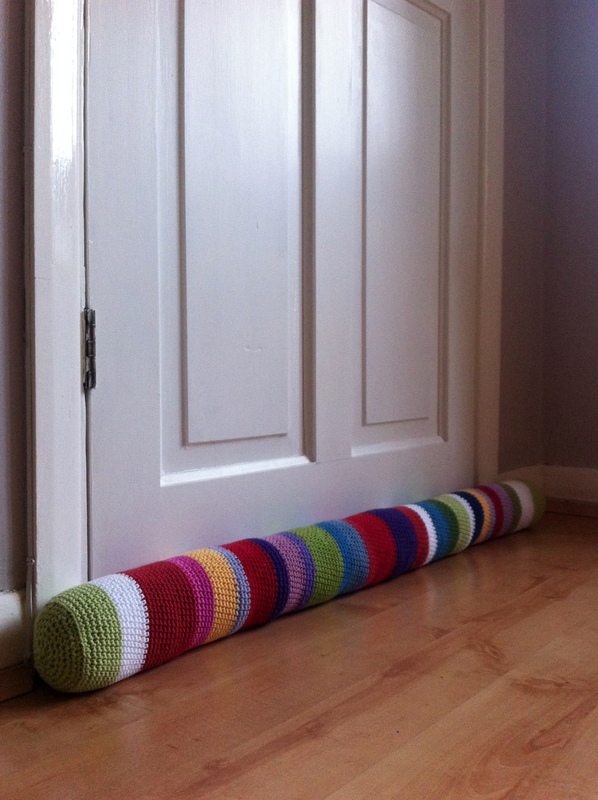 Hubby then made the very clever suggestion that we should add velcro strips to the stopper and the door, so that it will stay attached to the bottom of the door even when we LEAVE the room & close the door behind us. Isn’t that genius? So here we have it. The Striped Stopper, requested by Hubby, executed by Moi and, in an ever so masculine way, improved upon by Hubby. Identity Crisis blanket Ta Daaaaaaaaaaaaaaaaaaaaaaaaaah! To be fair I couldn’t work on it, or should I say “under it”, during the Summer and it a very big blanket. The point is: I finished it and I’m proud of it! 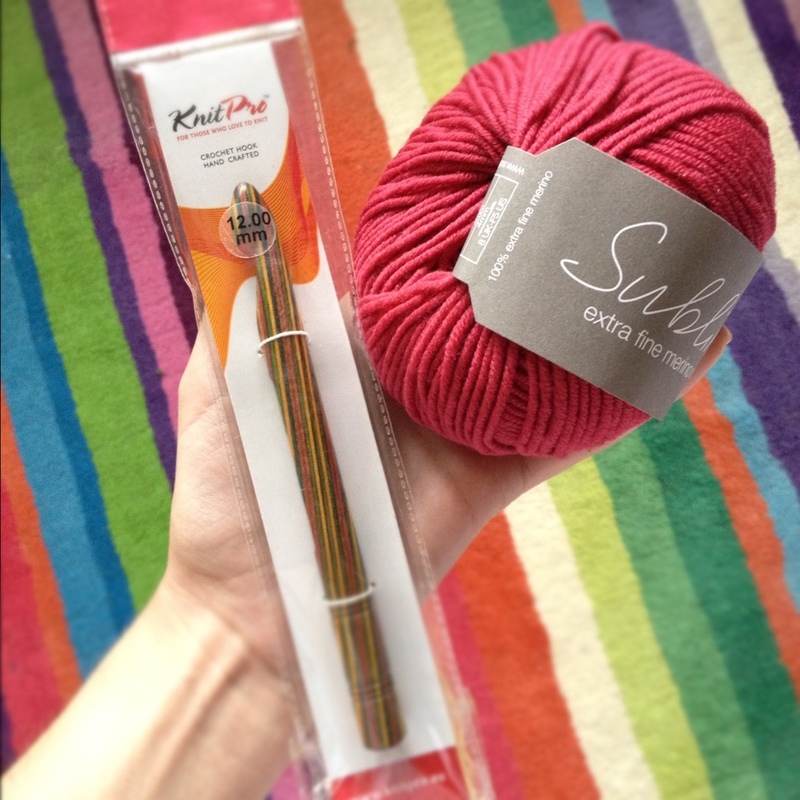 Yarn: Stylecraft Special DK. I think I used roughly 5 skeins of each colour, but it may be more. Colours: Plum (maroon), Meadow (green), Denim (dark blue), Parchment (off-white), Cloud Blue (light blue) and Mocha (brown). 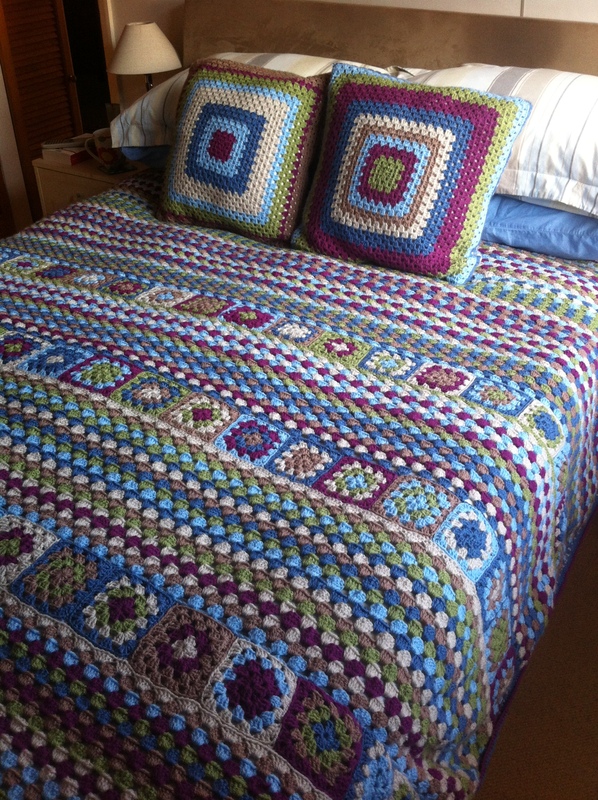 Layout: 72 rows of stripes, one row of 21 4-round granny squares, 20 rows of stripes, one row of 21 4-round granny squares, 20 rows of stripes, one row of 21 4-round granny squares and a final 72 rows of stripes. This is where it all started. 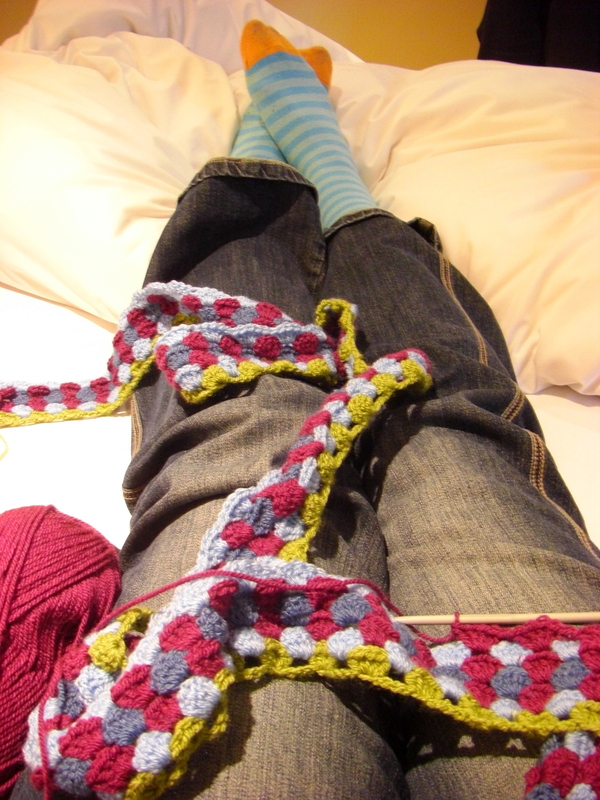 I took this photo on 21 November 2009 – one day after starting the blanket. I can hardly believe the blanket was ever this small! 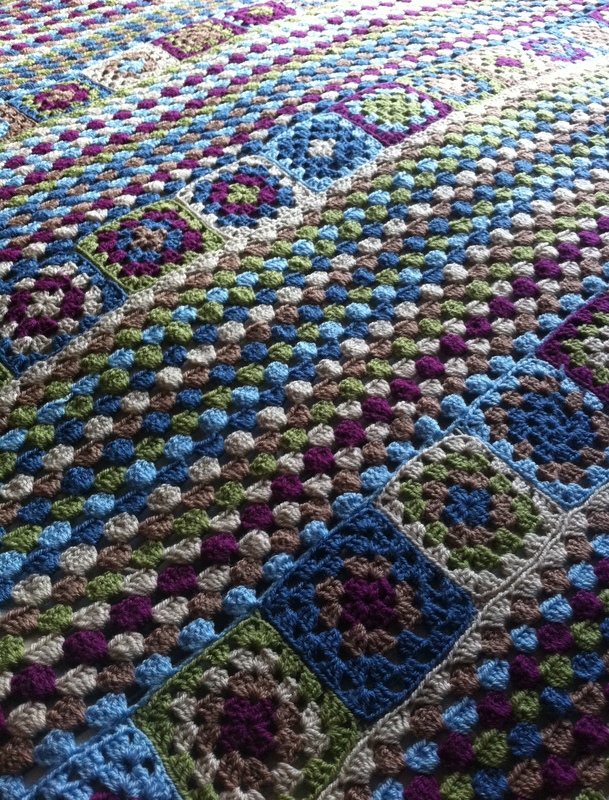 It hasn’t always been an enjoyable journey though… Here is what I wrote in the Notes of this project on my Ravelry page. I’m using Biscuit and Jam’s Random Stripe Generator. What an amazing tool!!! 31 December 09: I am really getting tired of working on this ginormous blanket. The only thing keeping me going is seeing how it changes as I add more stripes. Thank goodness for the stripe generator! 5 January 2010: I’m starting to resent this blanket cause it just doesn’t want to get bigger even though I already have 72 rows! I hook and hook and hook and it still looks like a really big scarf. 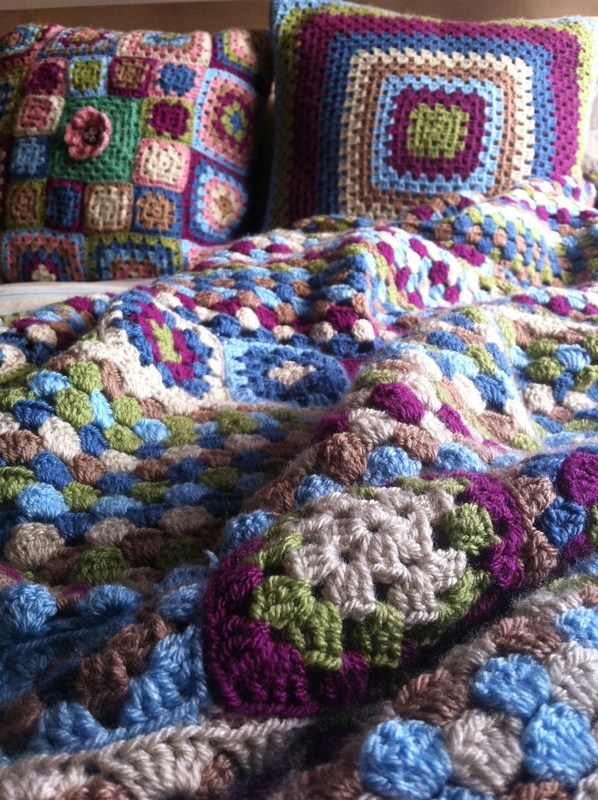 29 May 2010: I’m starting the blanket again, but I’ll be doing 4 round granny squares for the middle section. 30 August 2011: I’m baaaack…. 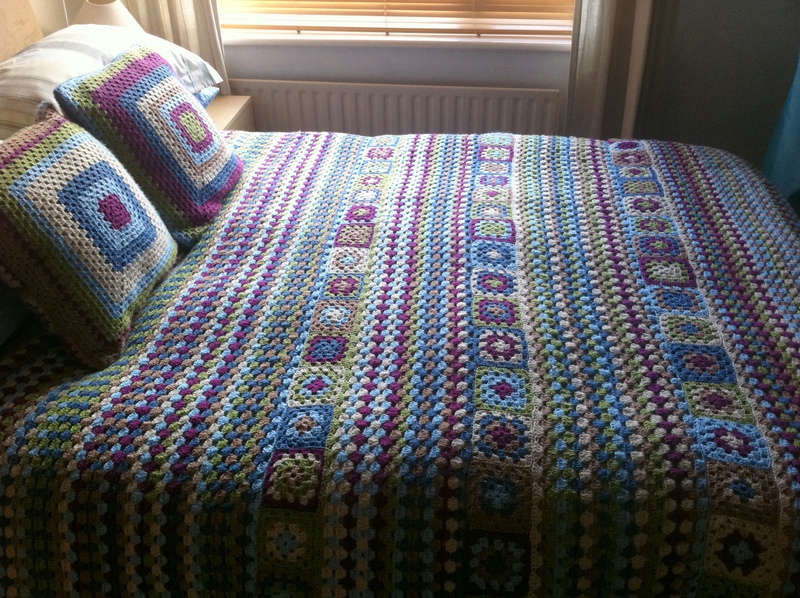 31 December 2011: All rows are finished and the blanket is the size I wanted. Weaving in of the ends and edging left to do. 1 January 2012: All the ends are woven in. 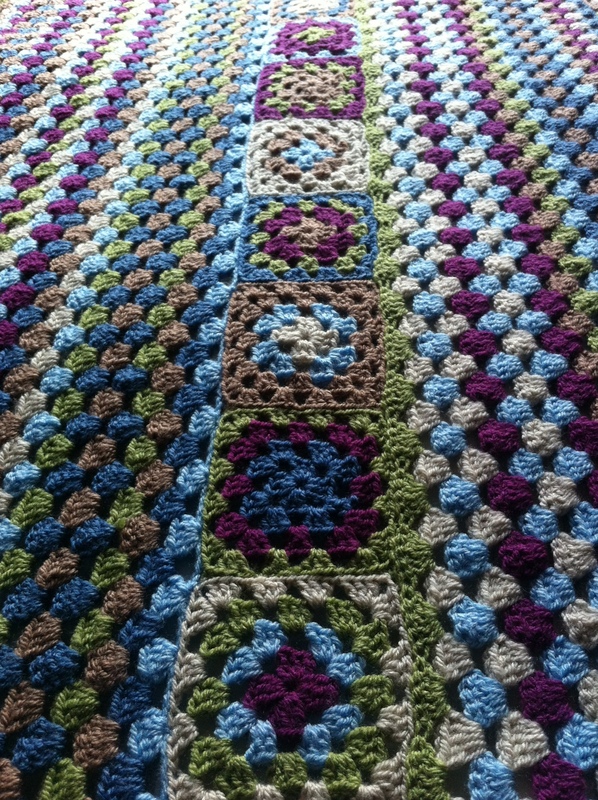 2 January 2012: Added Around the Corner Crochet Border # 112, and I’m done, finish, kaput! 20 November 2009 – 2 January 2012 in the making. It was all worth it in the end though. Here’s why. Thank goodness we have only one double bed in our home, otherwise I might just be tempted to make another huge blanket because, all things considered, I would do it again.